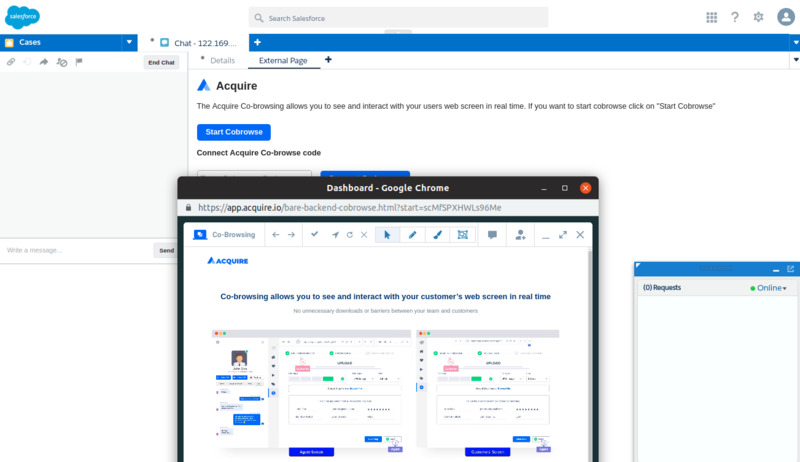 Acquire Cobrowse Package Salesforce Live Agent in allowing to connect Cobrowse with an online visitor. 1. Install package ‘Acquire’ in your Salesforce account. 2. After install Package you setup with your live agent app. 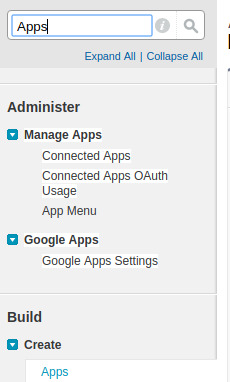 Find Quick Search in ‘Apps’ and click on dropdown menu ‘Apps’. Choose your console app and edit ( using for service cloud). Edit View in find ‘Include Live Agent in this App’ and check this. After checked you see below list in check ‘New Visualforce page’. New Visualforce page in click on the search button and choose to acquire visual force page ‘Acquire_Cobrowse_Code’and save this app. Now your backend process completed. First, open your fronted chat start button page and see your live agent setup code in ‘liveagent.init’ script. For enabling acquire single click button put a script above ‘liveagent.init’. Note: Above function param ‘Acquire_Custom_Code’ in not making any changes. You can put only your custom code and Use this function before ‘liveagent.init’. ‘YOUR_CUSTOM_CODE’ replace to your custom unique random code string. Same ‘YOUR_CUSTOM_CODE’ use as a acquire Cobrowse code in Acquire script after widget. If you want to help for manage random code and use in acquire script see acquire test page’s view source: https://docs.acquire.io/salesforce.html. After Completed fronted all steps you can use acquire app in ‘Start Cobrowse’ single click button. After All, setup opens your console app and agent status change to online. Send a request to your fronted page and accept the request from the agent side. After accepting request you see some tabs open in agent side. This tabs in an External page tab acquire app view showing. We are providing two methods to use co-browse. To click on ‘Start Co-browse’ button. You can able to use Acquire Co-browse now. Note: if you setup all frontend and backend process after you can use this. With this step, you need to pass you any “unique code” or any “custom_code”.